FREE Band & Choir Concerts! Did you know that our Community Choir and Band classes put on numerous concerts throughout the year? And most of them are FREE to attend! Our next free concert is coming up Monday, July 23, 2018 at 7:00pm. 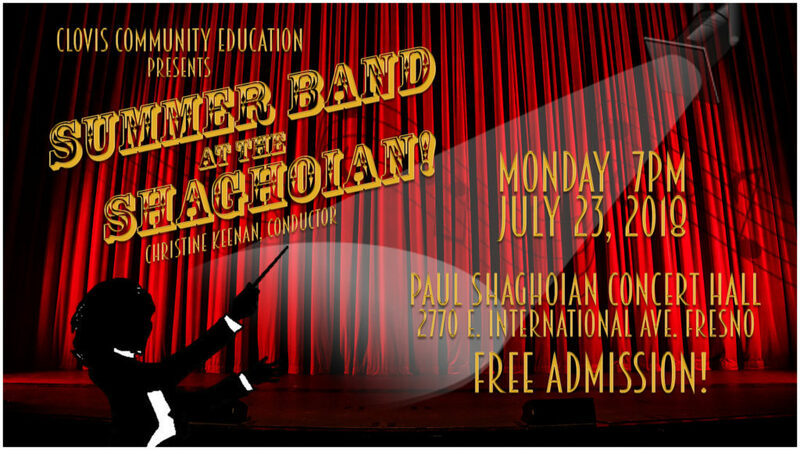 Come enjoy Summer Band at the Shaghoian as they perform a variety of music, including selections from the movies “The Greatest Showman” and “Coco”! Our Summer Band is over 90 members strong, from all walks of life, including high school students all the way to retirees – folks who love to play music and perform. The Paul Shaghoian Concert Hall is located in the Performing Arts Center on the Clovis North High School campus, at 2770 E. International Ave. near the corner of Willow and International. Admission for this concert is FREE! Arrive early to get a good seat, and bring the fam! What a great way to enjoy a summer evening, in the cool of the amazing concert hall, listening to great music with your family or friends. For more information, call the Community Ed office during office hours at 559-327-2876, or check out the event on our Facebook page. While you’re there, be sure to like and follow our page for updates and news on future concerts, catalog arrivals and registration dates, and news on our classes! View our Course Catalog online! Wrap up Christmas with Community Ed Gift Vouchers! Beginning Yoga – Learn The Basics! Are You Ready to be Fit For Life? ArtHop at Clovis Adult Education! Put Some Fun in Your Fitness! Don’t Miss the NEW Fluid Art Class! Woodworking Projects Class Is Back For Fall! NEW at Community Ed – Singing Lessons! Become a Notary Public – Full Course and Renewal Available! New Class – Acrylic Fluid Art! Become a Loan Signing Agent! © 2019 Clovis Adult Education. All rights reserved.